Simply apply the ready-made templtes to create high-quality animated videos. There are tons of preset scenes available for making animated video presentations for business, education, management and more. 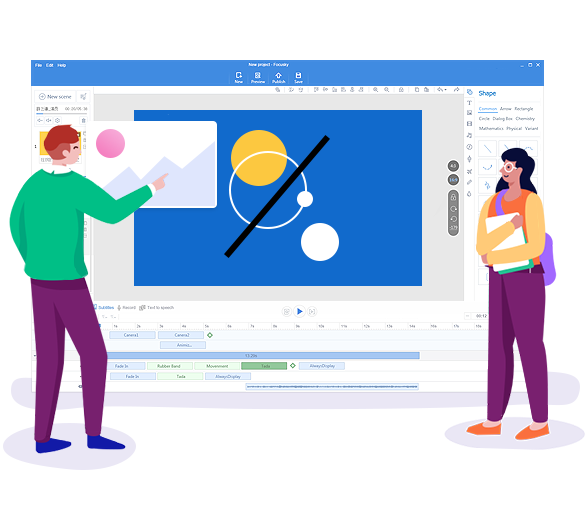 Animiz includes libraries with thousands of pre-designed assets like characters, icons, svg images, and shapes for animation designers. Make your video presentation with interactive effect and unique design that will engage audiences. You are allowed to upload animated videos to Animiz cloud for free. Moreover, you can upload videos to YouTube and share them to social channels(Facebook, twitter, etc) right away. Everyone can access your video presentations on different mobile devices seamlessly anywhere anytime. No coding and designing experience needed. Just create animated, engaging and captivating video presentations by dragging and dropping. Multiple free assets (roles, images, sounds, SWFs, charts, callouts, symbols, flashes, etc) are offered to create fabulous video scenes. Let the captions fly! Let the voiceovers play! Truly engage your audiences with interactive video presentations. Make full use of the simple multi-track timeline to customize background, camera, captions, animations and the like. Everything is just under your control. Spice up your video presentations with attractive animations. Hundreds of stunning built-in entrance/emphasis/exit animation effects is at your disposal. Three options to publish your project: online video, offline video and Gif. Your offline videos can be published in 6 different formats (.mp4, .mov, .wmv, .avi, .flv, .mkv). 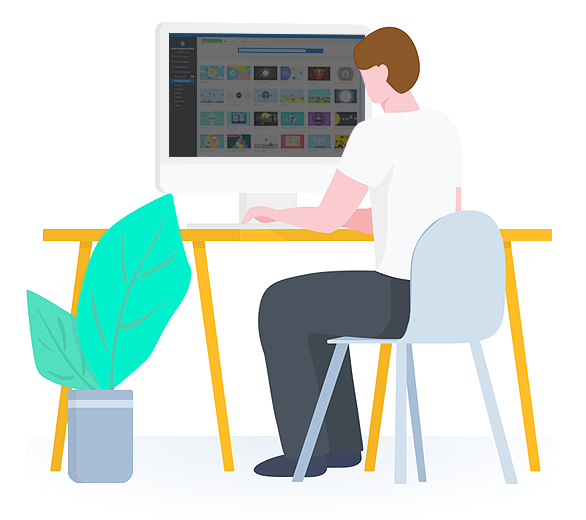 It is super easy for everyone to create animated videos with Animiz. 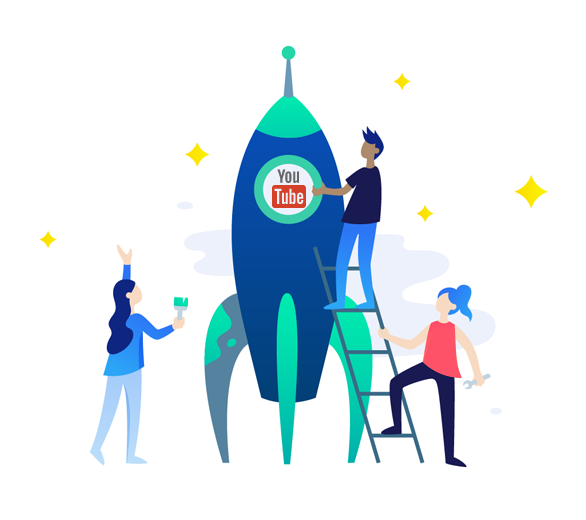 It can be applied to create animated video presentation, explainer video, storytelling videos, business video presentations, product video demos and the more. You can use Animiz to make animated videos or Gifs for work or just for fun. For example, I have used it to make an animated explainer video to introduce our school. Really amazing, awesome and funny! Making animated video has never been easier until I start to use Animiz. It just takes me few hours, not days to create breathtaking animated videos. Most importantly, I can share my online animated videos with my friends anywhere anytime. Amazing free animated video maker for newbie. I can make an animated video on my own even though I have no designing experience at all. It becomes easier for me to explain difficult points in a vivid way to my students with this software. Have fun with this easy but powerful tool. No coding. The multi-track timeline is really powerful. After adding objects in the canvas, you are able to customize animation effects, control animation playback and the more. Animiz has helped me a lot in making animated video presentations. Besides that, I can easily share my online videos with my customers, bosses or colleagues as well. All in all, I prefer this software than any other similar ones. Knowledge representatives available to assist you through email within 1 business day.